Whether I was correct depends upon your definition of the word require. If it means that you have a policy encouraging links in some situations and making them mandatory in others, the Times requires links. But if require means staff members actually practice that policy, the Times falls short. Link is acceptable in reference to a hyperlink on the web. If an article refers to material of interest to readers, such as a website, document, image or video, provide an embedded link as a convenience. Readers also value links to background information and other useful content. When crediting a competitor, providing a link is mandatory. That’s the first part of a longer entry on links. For context, I’ll post the rest at the end of this post. That’s a better policy than most, but it’s not strong enough. It doesn’t address linking as a matter of ethics, just as a “convenience” and “value” to readers. The only mandatory part is linking to competitors, which I applaud, since news organizations are shamefully reluctant to do that. And linking should be addressed in ethics codes and policies, not just stylebooks. I led a workshop today by Google Hangout for editors of Trinity Mirror newsrooms in the United Kingdom. The webinar dealt with information from my posts on Project Unbolt as well as my posts on verifying information from social media and a case study on a breaking news story covered by the Austin American-Statesman. The journalism establishment has not taken seriously my insistence that we regard linking as an essential practice of ethical journalism. Poynter ignored my advice in adopting its new Guiding Principles for the Journalist last year and the Society of Professional Journalists brushed aside my advice in adopting its new Code of Ethics. The New York Times perhaps never heard or read my advice, but it certainly doesn’t require linking to digital sources of information. Update: I have done a related follow-up post on the Times’ linking policy and practice. 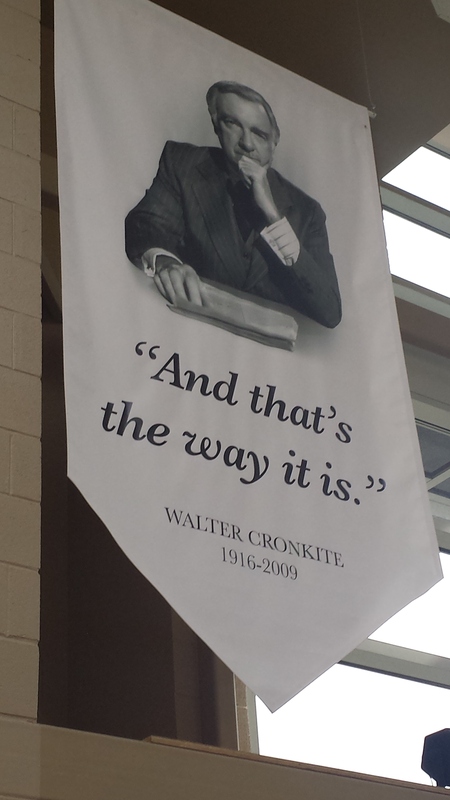 A large banner at the Walter Cronkite Memorial in St. Joseph, Mo., honors his famous sign-off line. By coincidence, my travel schedule this month took me on consecutive weekends to two universities with exhibits honoring Walter Cronkite.